The Trees Campervan Trips: Week 4. 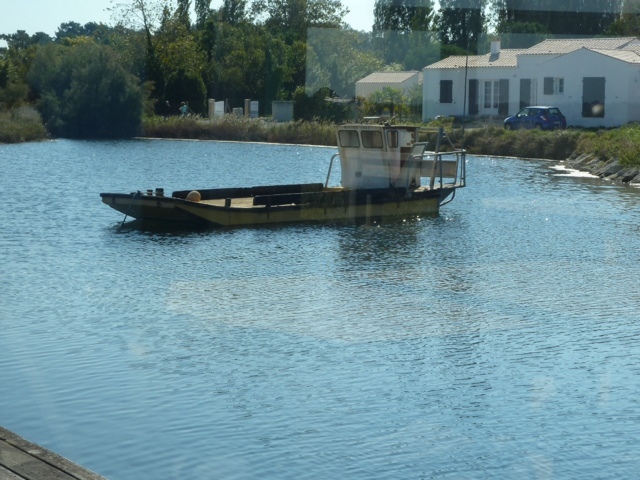 Charente Maritime completed! Week 4. 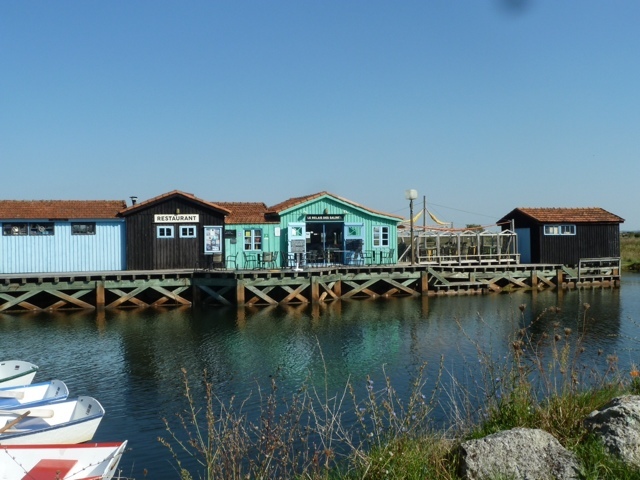 Charente Maritime completed! Another sunny day so we decided to cycle to another part of the island. Set off just after noon - our usual travelling time, but to be fair at this time of year the sun only gets going at mid-day and we're not working. We decided to have lunch out today to try the local seafood (Graham dusting off his wallet!) - heading off to St Trojan les Bain - stuated in the south of the island. En route we saw a typical charentaise fishing building at a place called Port de Salines - near a salt eco museum visiting site. This would do just fine- as we approached the place it was evident it was a well known restaurant (Michelin recommended said the sign). 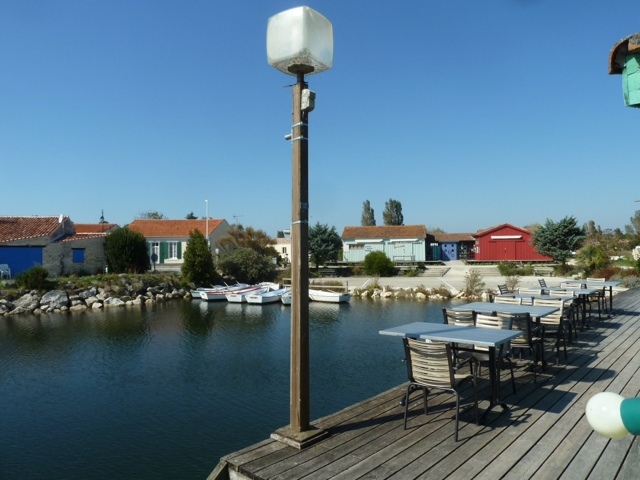 We were given the last table outside on the terrace overlooking a little harbour area and marshland - very pretty. We had the fixed price 3 course menu and a bottle of rosé - very civilised. Lobster bisque, followed by Fish pot de feu (fish stew) or Duck with a chickpea mash, and apple compote with meringue or a chocolate bombe creation containing sponge,cream and banana - we decided to try everything on the menu bar the oysters which unfortunately neither of us like! Not the simple seafood spagetti €9 lunch we had in mind, but it was a delightful surprise which we thoroughly enjoyed! As in all such places we enjoyed people watching - as usual most had fleeces, jeans, quilted jackets and the all important scarves, as we sat in out tee shirt and shorts enjoying the sun! Fashionable french men appear to find the need to wear a scarf ornamentally wrapped around their necks whatever they wear! View from our table whooo! The flat bottomed barques are used to harvest the oysters and other fruits de mer. Onwards to St Trojan les Bain - a village that overlooks the bridge to the island and mainland France. The tide was out so inevitably the coastline was inundated with - yes- cocklepickers!! We talk to one, an old chap and ask him what he is catching. Ver! (Worms). He says they're for his fish, not for eating ha ha, you idiot, which Graham, thinking of the carp in our (new) garden misunderstands. They're for fishing, bait for for cod and others. Evidently you need to be quick otherwise phut! They descend! He's not as quick as he used to be, he says, but he seems to have been quite successful today. We cycled along the coast with pine forest to the other side to another sandy beach where we spent a while resting to allow our stomachs to settle post lunch. 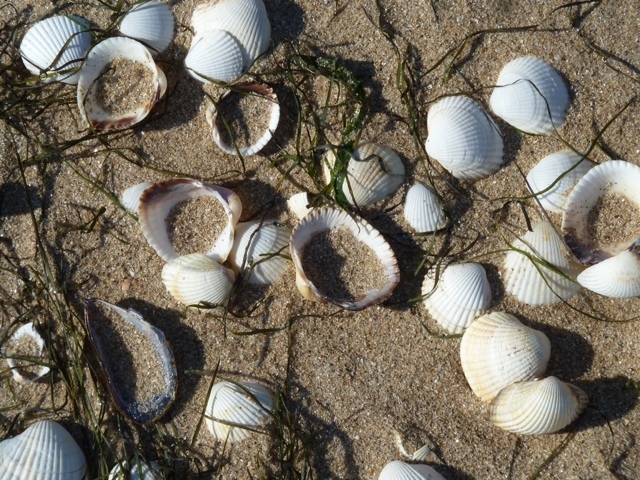 This beach was covered in cockle shells - a shell gatherers dream! Then back to the site following our tracks with a little detour when we lost our way - 18 miles in total today. 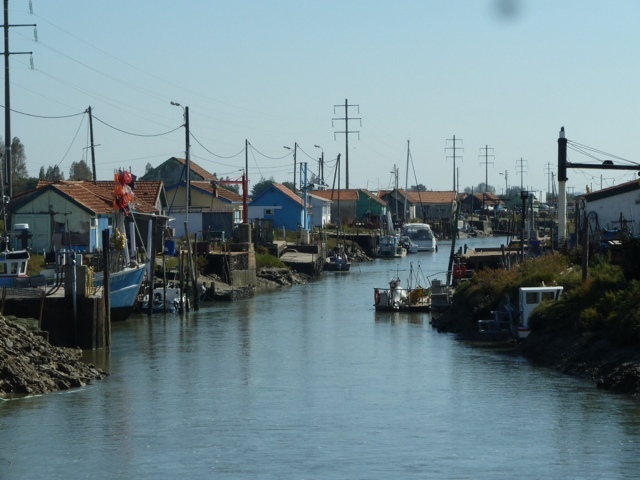 Extra little photo showing the interior of ile d'Oléron. On first look it's boring swamp land but we think it has a certain charm and definitely recommend a visit. All good weather must come to an end! 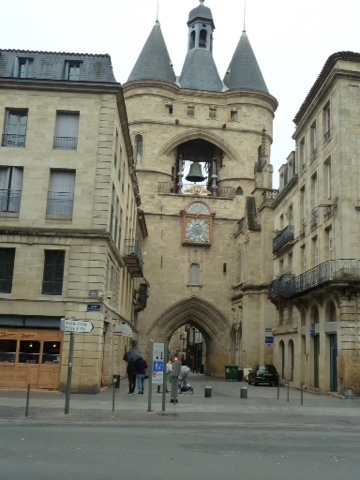 - with a forecast predicting rain for several days we left the Ille d'Oleron and headed for the big city - Bordeaux. We have an ulterior motive: there are Ikea and Maison du Monde shops in Bordeaux and it would be useful to try out a budget sofa in case we have to buy online - are they cheaper in France? Arrived late pm after the usual lunchtime drive, supermarket shop we arrive in rain. Dinner chez Rex - ready meal - Paella- watching the French rugby world cup with the odd glass of wine .. We are really embracing the french way of life! A restless and mostly sleepless night for Carol, as it lashed down with rain, thunder and the constant drips and plopping sounds on Rex's roof and sides felt like water torture! - Thank goodness for a backlit kindle! Graham slept on regardless. We cycle to the nearby shopping complex -with Ikea and Maison du Monde. The cycle paths are very impressive here - an easy flat ride took us about 15-20 mins from the campsite direct to the shopping centre. Decided despite the rainy weather we would do Bordeaux. Cycled the 8 kms to the centre along the again impressive cyclepath network. 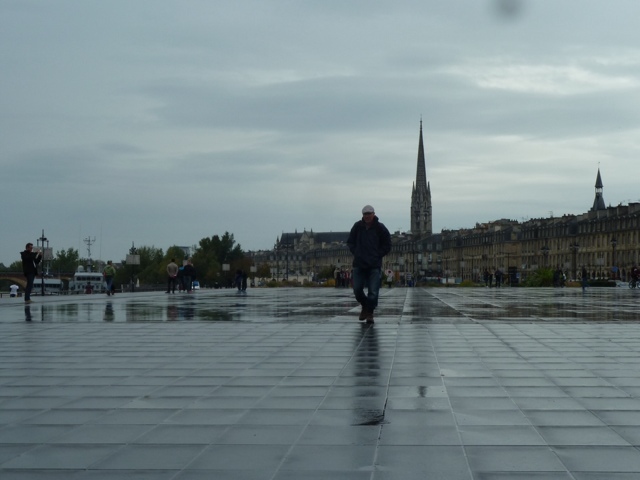 Bordeaux is one of the most cycle friendly cities we have visited - plenty of wide pathways for pedestrians and cyclists and a great tram network. Must be all those wine revenues. 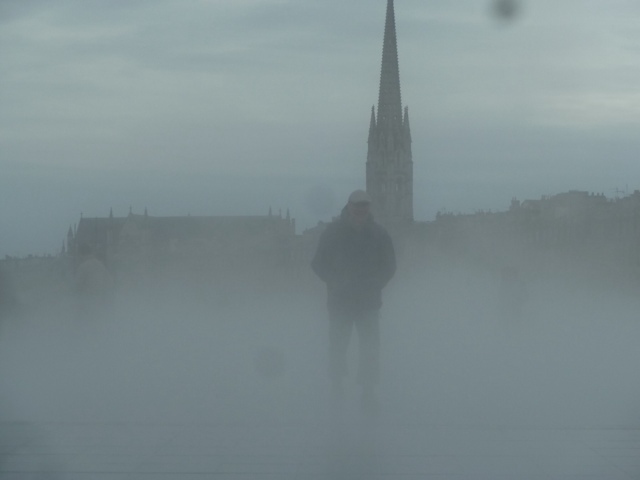 Cycled along the riverfront to the Place de Bourse - a mirrored pavement installation occasionally poured a stream of misty steam around the people standing upon it. 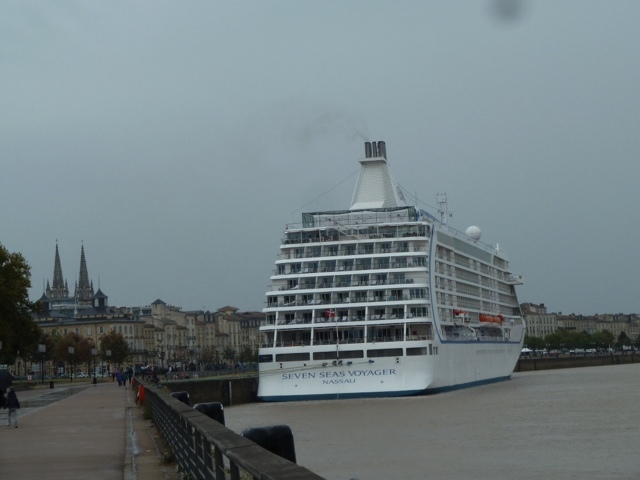 Walked around the centre - Bordeaux does not appear to be a poor place! There were lots of river cruise boats moored on the river and then we saw this miracle of man's ingenuity- which explains all the American voices round the city. How does it stay upright? Cycled back and arrived back just before the heavens opened .. Again ..! Could be worse - 17 dead in Cote D'Azur in worst floods for 20 years. Tomorrow we will head back up north. We purchased some chocs in a rather nice looking chocolatier today, and aim to drop them off for Ingrid the agent tomorrow as a thanks for all her help. Decided to stay over in Aytre just outside of La Rochelle with the aim to visit La Rochelle tomorrow to remind ourselves how nice it is. Weather not too good - cloudy with showers - still 20 degrees C though. Arrived at the campsite to discover the pool was still open - an enormous indoor one as well as outdoor. Enjoyed a brief swim - indoors- as it started raining as soon as we donned our cossies! Heavy rain overnight - we're both ready to head back home . However we will not waste our last day! Walked a very long km to the bus stop and caught the bus in to La Rochelle. The harbour and marina looked as lovely as we remembered but after a quick picnic rain arrived, so we meandered around the shopping area - very sophisicated! A few souvenir purchases were made ,but Carol disappointed as we didn't find the usual seasidy decor shops - she had hoped to begin building the decoration section of La Maison Pierre! No photos here of La Rochelle as we took them for last year's blog. Back to Rex and over a cuppa Graham got out the paperwork for our return crossing tomorrow night - yes we are booked on the 8pm crossing on the 6th Oct - WHAT! - that's this evening!! Oops - Graham had entered the wrong date on our calendar... It was 5.30 pm there was no way we could get to the ferry in time. After several calls to the Caravan Club we managed to rearrange our return - we leave at 4.30 pm tomorrow from Caen ,and as the ferry arrives at 9.15pm in Portsmouth we will stay at a Caravan Club site overnight near Fareham. Not quite the relaxed overnight crossing we had hoped for! Oh Well ... It could have been a lot worse. A long drive anticipated tomorrow and we will need to head off by 9am - a difficult concept for us to grasp as we have been managing to awake and breakfast by 11am the last few days! Nothing at all due to the tasting of the tasty cheap wine in the evenings! Up and at em - and on the road by 9.30am. bargain wine and food purchases or even the cheap diesel ... Boo Hoo. One of our friends is going to miss out on the promised bumper french sausage selection! Thank goodness we managed to buy a few bottles of wine at Leclerk a few days earlier. A rather bumpy crossing followed which seemed to last much longer than just under 6 hours. Graham had to abandon his dinner just as the cheese course arrived, having suddenly felt a need to lie down. Carol gamely stayed at the dinner table to finish the cheese and remaining wine - always willing to do the polite thing. Then back to Blighty - as usual all good things come to an end...... With the promise of a very exciting French adventure in 2016! A bientot! A la prochaine!